Rice cookers are not one-trick ponies. They can cook far more than rice -- including a whole pasta dinner. It's an ideal option when your stove or your pots are not available, and rice cookers can cook pasta in minutes. Combine pasta with your favorite sauce and it's ready in the same amount of time it takes to cook rice. You can even saute vegetables and brown meatballs or sausages in the rice cooker to enhance any pasta meal. 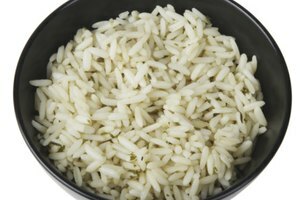 Add water to the rice cooker. Use about 6 to 8 cups of water for every 1/2 pound of pasta. Cover and set to cook until the water starts to boil. Add the pasta to the boiling water and a few dashes of salt. Stir the pasta briefly to keep the pasta from sticking to the bottom of the rice cooker. Cover and cook for eight to 12 minutes, or until the pasta is al dente, or firm to the tooth. 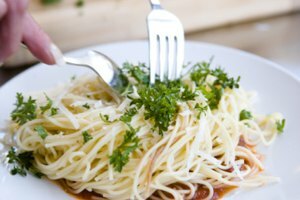 Check for doneness by piercing a piece of pasta with a fork and biting into it. Let it cook for a few minutes more if you prefer more tender pasta. Drain the water from the pasta and use immediately with your favorite pasta sauce. Drizzle olive oil in the rice cooker pot. Cover and set to cook to heat up the oil. Add sliced onions, garlic and peppers to saute in the oil, if you would like to include them in your pasta dish. Or add vegetables such as diced zucchini and squash. Brown ground meat, meatballs or sausage in the oil, if you prefer. Remove the sauteed veggies and browned meat from the rice cooker and set aside. Add pasta noodles and water to the rice cooker, along with a drizzle of olive oil. If using spaghetti noodles, break them in half so they fit in the pot. Use about 2 cups of water for every 7 ounces of pasta. Pour a jar of pasta sauce into the pasta and water. Use any type of sauce, such as marinara or Alfredo. Add the vegetables and browned meat back into the rice cooker and stir gently to incorporate into the pasta sauce. Season with salt and pepper. Cover and set to cook again. When the rice cooker stops or switches to the "warm" setting, stir the pasta well and check for doneness. Cook for a few more minutes if the pasta is not quite done to your liking. Season with salt and pepper and serve. If you already have cooked pasta, start by browning the meat and heating up the pasta sauce in the rice cooker, then stir in the cooked pasta and cook for just a few minutes to heat everything through. Rice cookers vary, so pasta may need more or less cooking time. Keep a close eye on the rice cooker and check the pasta periodically the first time you are making pasta to get the timing right.